Chelsea have made an initial enquiry about playing at Twickenham while Stamford Bridge is redeveloped. The Rugby Football Union has confirmed it has been in contact with the Premier League club but said talks are at a very early stage. 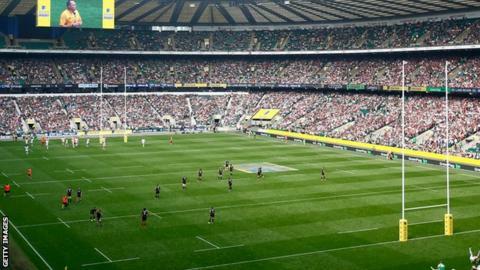 Twickenham is the home of English rugby union and the 82,000-capacity stadium has never hosted a football match. Chelsea announced in June that they are looking at possible expansion plans for their 41,800 capacity stadium - but the club has not set a date for any work to begin. Redeveloping Stamford Bridge into a 60,000 capacity stadium would boost match-day revenue and help Chelsea meet Uefa's Financial Fair Play guidelines. Blues owner Roman Abramovich had initially considered seeking a permanent new home, but there are few suitable sites available in London. Chelsea's bid to turn Battersea Power Station into an "iconic" new stadium was rejected in favour of a reported £400m offer for the 39-acre site from a Malaysian company. Twickenham, which has hosted music concerts and rugby league matches in the past, is around seven miles from Stamford Bridge and is thought to be just one venue under consideration as a temporary home - which is likely to be for a single season. A Chelsea spokesman said: "We're investigating different scenarios as part of the consultation process we started early last year, but have had no discussions of substance so far." Any possible move could not take place before the 2016-17 season as Twickenham is the main venue for the 2015 Rugby World Cup. The RFU added: "While we don't comment on any specific confidential conversations, each request is taken on its merit, assessing a variety of factors, such as the effect on the pitch, availability, transport and local considerations and other important implications." Tottenham have recently been linked with a move to play a number of games at Wembley or the Olympic Stadium in the 2017-18 season while White Hart Lane is improved.